There is a sliver of fact behind the asinine First Blood Part II. There were Vietnam prisoners still captive in 1985. There were attempts to rescue them. There were government inquiries into those missions. What didn’t happen is a single soldier wiping out 75 Vietnamese and Russian forces by his own hand seeking to rewrite history. Only Rambo (Sylvester Stallone) pulled that off. First Blood followed a town unwilling to accept the USA losing a war. That shifts in First Blood Part II – now it’s Rambo hoisting that loss onto his shoulders. The totality of the war’s fallout is on display in this sequel. A government stooge, Murdock (Charles Napier), carries arrogance into the mission, touting superior weaponry and technology as an invincible force. It’s the same bluster and gusto that led to Vietnam’s failure. POWs trapped in a camp put Rambo back into the jungle. Turns out this is a PR move to subside the fears of Stateside families. Colonel Trautman (Richard Crenna), the one voice Rambo trusts, speaks vividly of veterans and their importance. He’s a metaphorical American flag, waving red, white, and blue as he attacks a left-leaning Napier. Ronald Reagan reportedly cheered First Blood Part II; the voracious anti-government, pro-war, pro-soldier motif certainly skewed Reagan’s way. Eventually, he quoted its lines. There’s no subtly though, despite having real world cause on release. First Blood Part II doesn’t examine the issues so much as warp them into parody. Note Rambo turned into action figures and a Saturday morning cartoon series; this is effectively the live action version of both. The same year as First Blood Part II, Stallone starred in Rocky IV. In tandem, these films pair well. While First Blood II attacks Vietnam, a duality appears – it’s the Russians too, supporting the Vietnamese. May as well topple the Cold War while solving a lost war. Later, K.O. the steroidal Russian in the ring. All of the Rambo tropes start here. The sweaty, muscular hero with ammo strapped around his arm. The headband. Mowing down entire lines of troops with a sweep of a gun. Enemy forces who shoot worse than Star Wars Stormtroopers. 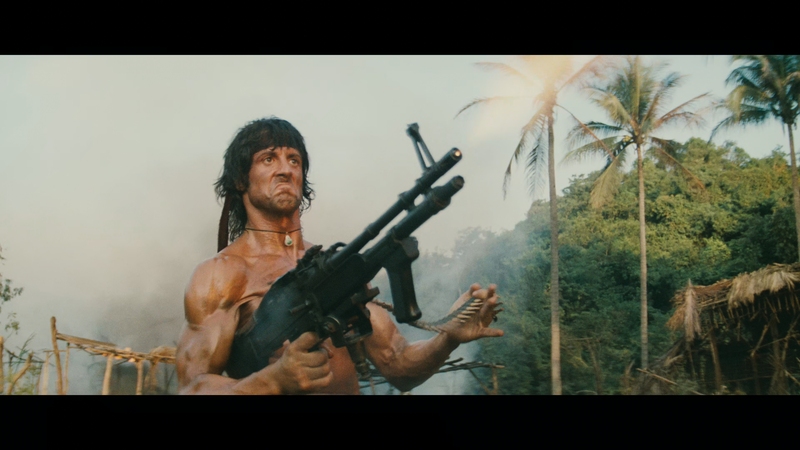 Rambo’s innate ability to wipe out helicopters. Key to First Blood Part II’s issue is how little it realizes the absurdity. Early in the film, asked what he wants, Rambo replies, “To win!” Before the credits roll and asked the same question, he replies, “For our country to love us as much as we love it!” Campaigning politicians use less blustery language, and do so with less camp value. It’s not the message – Rambo isn’t wrong – rather First Blood Part II’s exaggerated, commercial execution. Debuting on UHD with a new 4K master, scenes of Vietnam jungles (really Mexico) display outstanding definition. The detail of the grass, the trees, and the crops show remarkable improvement over previous home video releases. 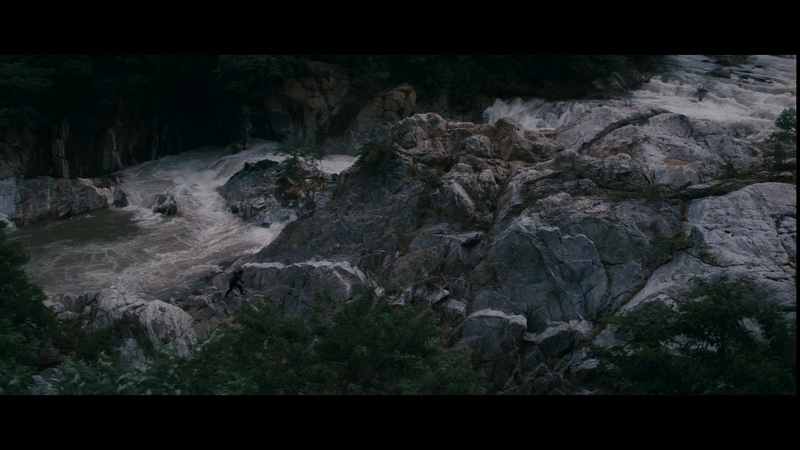 Shots near a waterfall with water-soaked rocks look incredible. This goes for close-ups too, drawing out facial detail in droves. 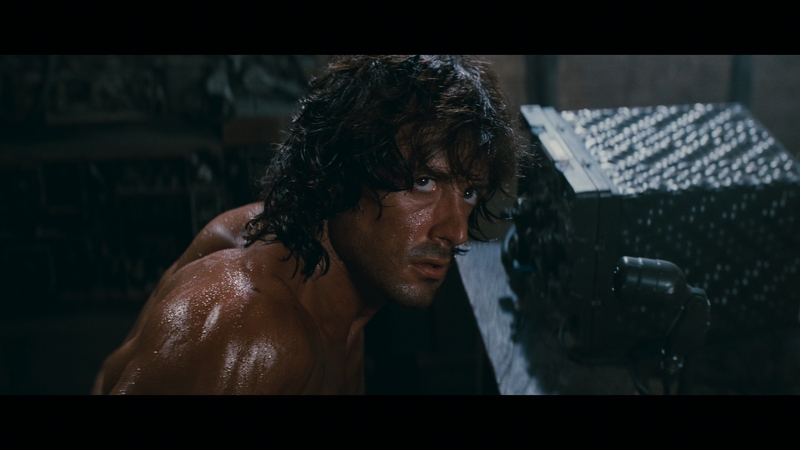 As First Blood Part II moves forward, Stallone’s sweaty body draws light and reflects texture. Improvements to color saturation builds a convincing, natural palette. Flesh tones never waver, and the lush greenery looks dazzling. The slight warm push suits the setting without losing the film qualities. Helping is a minor grain structure, readily resolved and clean. Based on film stock alone, First Blood Part II carries a heartier budget than the original. Everything is better controlled. The only downer is the HDR pass, skewing subtle. That’s fine, but likely a sour spot for some looking for First Blood II to gain density. Black levels match First Blood for much of the runtime, an unripened gray lacking impact. Moments of true black appear pasted on rather than being an organic shadow. 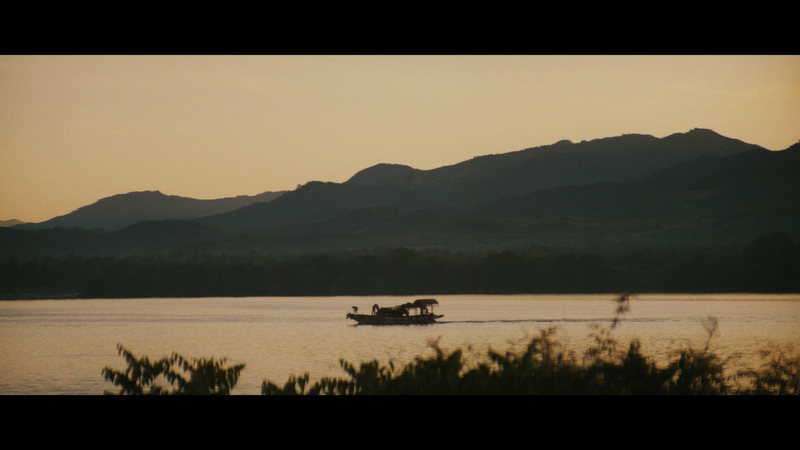 Unlike the first film, this is not an issue during daylight cinematography where depth excels. Highlights maintain neutrality, raised only for the glint on Rambo’s knife or the occasional light source. Ported from the Blu-ray, the DTS-HD mix of an Oscar-winning sound edit presents with age. Notably, that’s in the low-end where bass pops with a muddy, loose quality. Explosions rumble, but falsely so. There’s also an issue of volume; the overall track runs low and getting decent range requires an increase to achieve. Minimal separation track helicopters flying around the soundstage. A bullet or two sweeps into the rears. Stereo channels take on most of the positional work, aside from a great rain effect. Fidelity matches the ‘80s era, with raw dialog and exaggerated highs. The UHD carries a commentary track from director George Cosmatos. That’s shared with the Blu-ray, where the rest of the bonuses reside. 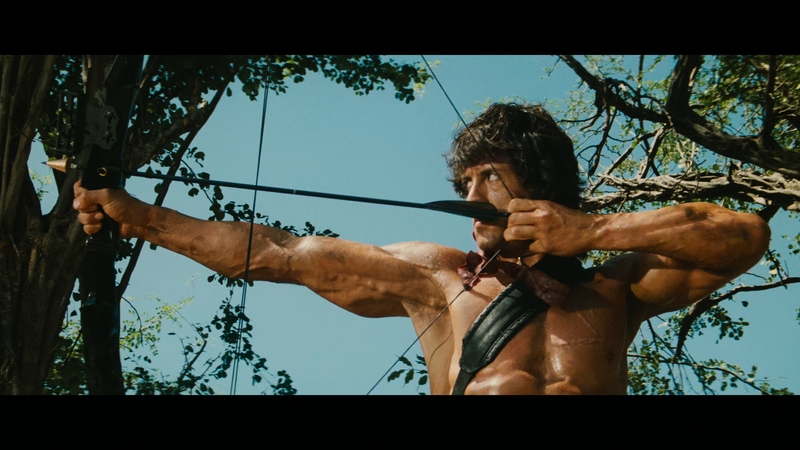 Rambo Takes the ‘80s continues a retrospective from First Blood’s disc. This chapter runs 12-minutes. An older featurette titled We Get to Win This Time runs 20-minutes, and note it’s horribly stretched horizontally. A few promotional news shorts follow, along with separate interviews with Stallone and Crenna. Some raw set footage, a look at the restoration, and a workout to get you into Rambo form come in last. A relic of political discourse, Rambo: First Blood Part II skewers itself with self-parodying action in-between moments of moralizing.